Back in May, we learned that another lucrative prize was coming to the Canadian music world: the SoundClash Music Award, which aims to celebrate Toronto-based indie artists. Now, Saidah Baba Talibah has been announced as the inaugural winner. The soul/rock songstress, who recently released her debut LP (S)Cream, will take home $5,000 plus a prime performance spot at the city's Hot & Spicy Food Festival on September 2. Runners-up Kids & Explosions will receive $3,000 while third-place finisher Young Empires get $2,000. Honourable mentions went to the Worst Pop Band Ever and Miles Jones. The winners were chosen by public votes in addition to a panel of judges. Over 250 artists applied to be a part of the competition, which included live performances at Toronto's Harbourfront Centre this past July. 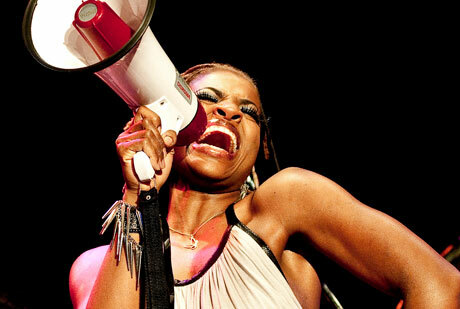 In a press release, Harbourfront Centre's artistic coordinator Dalton Higgins had this to say about Saidah's victory: "She showcased her sassy vocal chops, coupled with great live musicianship, gutsy songwriting and costuming (no, that tradition ain't fully dead), so she clearly deserved to win." Head here to read Exclaim! 's newly published feature on Talibah and here for a recent online feature on her new (S)Cream album.